Friday Transportation Seminars at Portland State University have been a tradition since 2000. With the start of 2019, we’re changing it up a bit! The seminar will be delivered 11:30 am (sharp) – 12:30 pm, with additional discussion over coffee and donuts (protect the planet—bring a mug!) from 12:30 to 1:00 pm. You can also watch online. 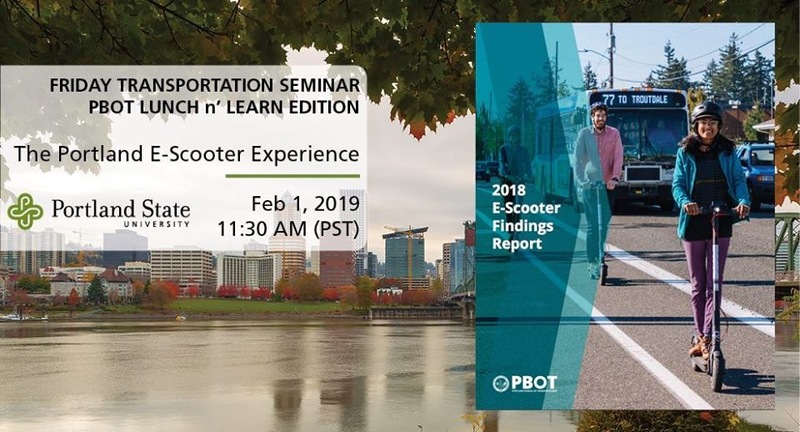 Periodically, as part of this new format, we’re teaming up with the Portland Bureau of Transportation (PBOT) to bring you special editions—featuring guest speakers from PBOT—merging our seminar series and the long-standing PBOT Lunch & Learn. Portland’s E-Scooter Pilot made national news for its proactive and data-driven approach to exploring the role of e-scooters in our transportation system. One of the first cities to implement a comprehensive data sharing agreement with e-scooter providers, Portland now has a lot of findings to share. This Friday Seminar will dive into both the data collected and the experiences of Portlanders during the pilot. We’ll discuss what worked well, unexpected findings, and considerations for future new mobility pilots.